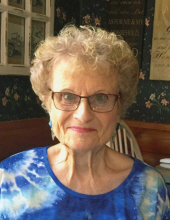 Elizabeth Vernell “Betty” Crowdis, 83, of Elk City, was born to Clarence Clinton Driver and Lillie Ethel (Trent) Driver on their farming home place outside Hammon, Oklahoma, on July 16, 1935. Betty was the long-awaited child of her dotting parents and prided herself growing up on a farm during the Dust Bowl and the Great Depression. During a brief period in her childhood, her parents moved the family to New Mexico to escape the Dust Bowl and the health effects it had for a young Betty who was growing sick from the dust. The family returned to Roger Mills County where Betty, who was nicknamed Vernell at the time, graduated from Leedey High School in 1953. While attending Southwestern Oklahoma State University in Weatherford, she met a young, dashing Marvin Lee Crowdis. The pair married in her grandparents’ home on December 10, 1954. Her husband, better known as Buck, had enlisted in the United States Marine Corp two years before the couple married. When she committed to lifelong companionship, she also committed to be a military wife and homemaker. The couple were stationed at multiple bases during Buck’s 23 years in the Marine Corp. During that time, the Lord brought them their children — Dennis from North Carolina in 1958, Brian from Florida in 1961 and Barry from California in 1964. Betty returned in western Oklahoma when her husband was deployed to war in Vietnam on two separate occasions. During Buck’s 1965 tour, he was wounded on April 16 during an intense firefight covered by Time-Life’s award-winning journalist Larry Burrows. Betty often recounted the days that she was uncertain of Buck’s safety serving our country as some of her most trying, yet she continued as an active mother to her three young songs. Following Buck’s final Vietnam tour, the family was stationed in Okinawa, Japan from 1969-1972. Betty reflected upon this adventurous period with happy memories. The three stints were her first exposure to flying roaches she laughed as “being big as a bat,” but also cooking Asian food. Betty was locally famous for her hostessing skills and credited her time as a Lt. Col.’s wife in cultivating that. Long before sushi restaurants were in American, Betty was serving elaborate Japanese dinners with multiple tempura pots. After Buck retired from the Marine Corp, the couple became members of the Elk City First Baptist Church. A skilled pianist from her youth, Betty loved volunteering for the church choir. She also lent her cooking skills to various church camps when her grandchildren were young. Betty was the ultimate “girlfriend” woman. From her involvement in her sorority Preceptor Gamma Iota, the Arimethia Club, the Birthday Club and a host of other groups, she enjoyed socializing and hosting. Her luncheons remain legendary. Following Buck’s retirement, the couple continued to travel the country and world. In 1991, they got the first of their travel trailers. With it, they took their granddaughters and their friends through Oklahoma, Texas, Colorado and most the American South. Both Buck and Betty emphasized museum visits. On solo trips, the couple spent months in warmer climates to avoid winter freezes. They also would adventure through Asia, Europe and South America for weeks and sometimes months at a time. At each outpost, Betty learned a new cooking skill. Betty was also a world-renowned shopper, so much so that even her teenage granddaughters would sometimes tell her to call it a day. She would arrange special shopping trips in Hong Kong to buy authentic jade or buy the best bottle of wine in Italy, even though she didn’t drink and only wanted it to cook a gourmet Marsala sauce. Betty was always willing to use her shopping talent to benefit the less fortunate and secretly paid wardrobes for disadvantage children. Her spice rack and collectibles would be envied by all world travelers. When her grandchildren were small, she kept two photos hanging on her bedroom wall — one of Ronald and Nancy Reagan and the other of Jesus Christ. She loved her God and she loved her country and devoted herself to serving both the best she knew how. Funeral service to be held at 10:00 a.m. on Thursday, January 31, 2019 at First Baptist Church, Elk City, Oklahoma. Dr. Russell Duck will officiate. Interment will be at Red Hill Cemetery in Hammon, Oklahoma. Services have been entrusted to the care of Martin-Dugger Funeral Home of Elk City, Oklahoma. She is survived by her husband of the home, Marvin Crowdis, son Barry Crowdis and wife Katraca of Canute, son Dennis Crowdis of Elk City, daughter in law Star Crowdis of Grass Lake, Michigan, granddaughters Trisha Crowdis Barnes and husband Jimmy and Katie Crowdis of Elk City, Shonda Crowdis Little and husband Rowdy of Cheyenne, Levi Crowdis of Elk City, Shawn Warren and wife Tracy of Southbridge, Michigan and Sarah Thomas and husband Shawn of Grass Lake, Michigan and 17 great-grandchildren and a host of friends and relatives. Betty is preceded in death by her beloved parents, Clarence and Lillie Driver and one son, Brian Crowdis. Memorial contributions can be made to First Baptist Church of Elk City in care of Martin-Dugger Funeral Home PO Box 707, Elk City, Oklahoma 73648. To send flowers or a remembrance gift to the family of Elizabeth Vernell "Betty" Crowdis, please visit our Tribute Store. "Email Address" would like to share the life celebration of Elizabeth Vernell "Betty" Crowdis. Click on the "link" to go to share a favorite memory or leave a condolence message for the family.